The overall objective of the proposed work is to contribute to the policy discourses on implementing Nationally Determined Contributions (NDCs) in the post-2020 agreement, role of international cooperation (on finance and technology), and address gender dimension in mitigation actions. The activity tracks all NDCs for its linkages between NDCs and Sustainable Development Goals (SDGs). Preliminary work around this has been captured in a web-based tool (www.ndcfootprints.org), which provides a platform for academicians, researchers, and even other enthusiasts on the subject to easily access a compact and comprehensive interactive tool for understanding NDC and SDG complementarities. The web app provides an overarching view of each country’s profile in terms of the economic indicators, climate action chronology as well as the linkage chart. There is also a separate tab for accessing region-wise NDC–SDG target matches in order to acquire an overview of how Asia as a region responds to the linkage. Another part of this activity will address three broad questions—1) how are India’s NDCs placed in international context when compared with other submitted NDCs? ; 2) domestically, how India’s NDC can contribute in achieving its SDGs? ; and 3) what will be the role of different actors in the implementation of India’s NDC? Climate finance landscape has rapidly evolved since the quantified commitments were made in Copenhagen in 2009. New institutions have been built, such as the Green Climate Fund, which have also started to deliver finance. Outside the UNFCCC context, bilateral and domestically mobilized finance have also increased. Since public finance alone will be insufficient, the role of private finance has become increasingly important. This activity will entail mapping private climate finance landscape in India: identifying main financial actors, key area/sector wherein actors are investing, barriers and challenges in mobilizing private climate finance. This is followed by drawing up a list of successful business models across regions and sectors to overcome the barriers and studying them from the lens of impact, innovation, replicability, and scale. Conditions for transferability of select best practices in India will also be studied. India’s INDCs are conditional on international support on technology transfer, finance, and capacity building. A non-exhaustive list of technologies has also been included. The Paris Agreement has broadened the scope of the technology mechanism of the United Nations Framework Convention on Climate Change (UNFCCC) to also include joint R&D. Technology-centric transformational actions will play a critical role in achieving India’s NDC and maximizing SDG co-benefits. In this context, this activity will focus on identifying specific cooperation needs, including international mechanisms, relating to technology development, transfer, and diffusion that will not only enable India to implement her INDCs but would also be instrumental in increasing the impact. This activity will aim at big impact technologies which require specific international cooperation. To this end, it is important to first analyse the Indian NDCs to identify various options and underlying technologies. Subsequently, a few big impact options with greater international cooperation needs related to technology development, transfer, and diffusion will be identified through stakeholder and expert consultations. The attempt would be to ensure that detailed analysis of the selected options enables comprehensive understanding of scope of enhancing socio-economic as well as mitigation benefits in at least one sector relevant to India’s NDC. This activity will examine the gender dimensions of activities listed in the above activities. Since the gender question has been defined in multiple ways and contexts, it is important to apply a comprehensive framework of analysis while analysing gender dimensions of mitigation actions, including international collaboration. The first major component would be to develop a comprehensive framework of analysis that goes beyond numerical representation of various gender groups among the beneficiaries of a project or policy and also includes qualitative aspects ranging from the process of conception of idea to implementation and benefit sharing. In order to generate empirical evidence on gender in the context of overall objective of this project activity, we will focus on learning from other country experiences regarding ensuring gender equality in implementing mitigation actions and international cooperation. This will be ensured by undertaking case studies on the aforementioned themes. For wider dissemination of project findings, the project will regularly publish working papers, policy briefs, and organize dissemination events, including during UNFCCC meetings. A regular quarterly issue of ‘Mitigation Talks: A Series on Nationally Determined Contributions’ will be published to initiate discussions around the above themes and present some early findings. 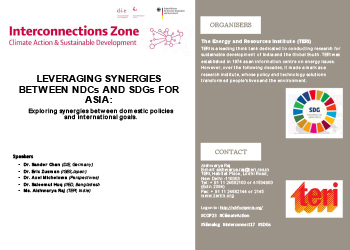 LEVERAGING SYNERGIES BETWEEN NDCs AND SDGs FOR ASIA: Exploring synergies between domestic policies and international goals. The Paris Agreement in 2015 laid the premise for many countries (including India) to submit concrete and ambitious climate action plans in the form of Nationally Determined Contributions (NDCs).